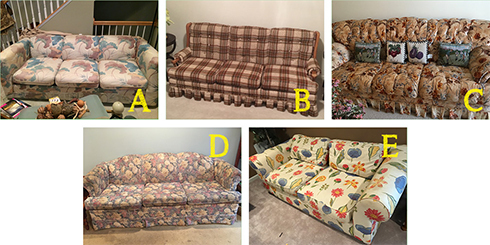 With out of date sofas like these, it's time to shop for a replacement! Look no further; The Belfort Furniture Clearance Center has an amazing selection of designer sofa styles at great prices, in beautiful covers and available immediately. The sofa is the key furniture piece to anchor a living room space and when it comes to selecting one, there are many factors to consider. We selected several of our favorite living room sofas currently available in our Clearance Center to show you some great options and provided some tips for sofa shopping below! 1. L-Shape Tufted Back With Chaise 2. Traditional 2-Piece Sectional With Rolled Arm 3.Contemporary L-Shaped Sofa With High leg 4. Three Over Three Seat Cushion, Straight Arm 5.Skirted Sofa 6. Two Over Two Seat Cushions With Nail Head Trim. 1. Consider the size of your space, measure the area and do a simple floor plan; you can bring this with you when you are ready to shop to help you in choosing the right size sofa for your space. 2. Analyze your lifestyle: which room is your sofa for and what will your activates entail while using this room. This may help you decide what fabric you'll need on your sofa or what color would work best for you. Research materials such as Sunbrella and other performance fabrics that repel stains. 3. How many guests will you entertain in the space? This tells you how many seats are needed or if you'll need additional seating in the space like accent chairs or loveseats. 4. What are your style preferences? With so many sofas to choose from, narrow down the options by selecting what style sofa you're looking for to fill your space - contemporary, modern, traditional, eclectic, casual? If you're not sure, think about other parts of your home and what existing furniture you have! Now that you are ready to start sofa shopping, our sales associates at the Belfort Clearance Center are available to help you select the perfect sofa! Shop our Clearance Center and Warehouse at 22250 Shaw Road, Sterling VA 20166. Our Clearance Center is re-stocked daily – items are first come, first save!